The Heads are well known to most by now and have been on the underground psych rock scene for many years while. 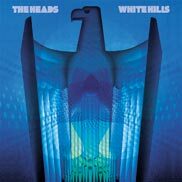 White Hills from NYC are quite new and gaining an expanding audience all the time. Like the Heads, they also seem to release a number of limited edition things on a number of different labels and are quite productive. The record starts with the Burning Up side and the long White Hills track, I will find my Piece of Mind. This is a very tripped out and psychedelic rock track and is really inspired by the HEADS. You can hear the influence of the band on White Hills. I guess all insane psychedelic rock guitar bands that exist today have been influenced by the insane manic rawness and power of the Bristol band. Great White Hills track for sure. Burning Out (Side B), captures the Heads delivering the Camden Brain Slurry and I guess this is to describe what your brain will be like if you play this side too many times at high volume! It is pretty slow and stoned and repeats over and over at the beginning and then after a long total acid guitar solo, the stoned track continues and the guitar solo switches to the other channel. Cool low fi stoner stew track. Phew… Let’s hope that these two groups release more volumes of Collisions together or perhaps that is just the name of the record label’s new series of split psych LPs.. We will see in the future.